This used to be the question I would face almost every single day from my parents and teachers. But I couldn’t explain to them what I felt. Like them, even I had this feeling that I hated people, that I hated talking to people and would prefer a cozy corner of the room engrossed in my books. I was labeled as an introvert, someone who hates socializing. Things at college didn’t change much but the more I grew, the more I tried to understand myself; why do I hate talking to people? Why do I love being with myself? Why do I avoid people? College days were not so full of friends for me because I could never get out of my shell. Parties were not my cup of tea either. I hated getting invited to parties. ‘Oh no! Not another one!’ would be my reaction whenever anyone would invite me to a party. The moment I enter a room full of people, I just get repulsed by the way people keep on talking to each other…so fast…yet so shallow. That’s what I dislike most. It’s not that I don’t like people but I have not been able to fathom how could people just simply hug one another, a few minutes after meeting for the first time? And I could never do that to myself. But going to a party and not talking is indecency. To maintain modesty, I had to. It’s been horrifying for me. It’s like you enter some alien land and you are forced to talk to them…talk to so many people and you have a stopwatch; your time is running out. It’s not that I hate people but the fact is that I don’t feel comfortable with them. I find it difficult to open up to any random person within moments of meeting and talk. 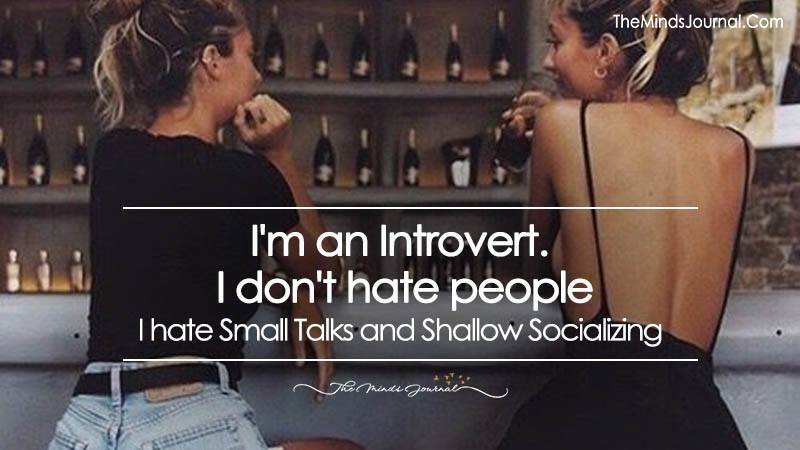 What people usually think of introverts as ‘people haters’ is a misconception. I do not hate people. Why would I? I was always bugged by this question. What’s the issue with me? This made me take up courses on psychology and understand this nature of myself. Browsing through social media sites, I also found out that I was not alone. And the point is not about hating people either. It’s about being comfortable with the ones you interact. Conversations mean a lot to me; conversations matter to me and it is through conversations I strike chords with people. For a good conversation to mature, I need time, I need space and I need the right kind of frequency. Human beings are wonderful creatures. The human psyche is even more wonderful. I cannot and obviously, I do not expect each and every people I meet to think like me, to act like me, to love the things I love, to do the things I do. But then again, I do know that there are people like me too. In gatherings, it is impossible to tell in a few moments what kind of people are there. There can be introverts like me too, who knows! You get a lot of memes about introverts in the social media. Even I enjoy making some too.